A fossil is the remains or traces of a once-living plant or animal that was preserved in rock or other material before the beginning of recorded history. The term also is used to describe the fossil fuels (oil, coal, petroleum, and natural gas) that have been formed from the remains of ancient plants and animals. It is unusual for complete organisms to be preserved. Fossils usually represent the hard parts, such as bones or shells of animals and leaves, seeds, or woody parts of plants. Fossils occur on every continent and on the ocean floor. Through paleontology (the scientific study of fossils), it is possible to reconstruct ancient communities of living organisms and to trace the evolution of species. Fossils of single-celled organisms have been recovered from rocks as old as 3.5 billion years. Animal fossils first appear in rocks dating back about 1 billion years. The occurrence of fossils in unusual places, such as dinosaur fossils in Antarctica and fish fossils on the Siberian steppes, is due to the shifting of the plates that make up Earth's crust and environmental changes (such as ice ages) over time. The best explanation for dinosaurs on Antarctica is not that they evolved there, but that Antarctica was once part of a much larger landmass with which it shared many lifeforms. Most fossils are found in sedimentary rocks, those rocks produced by the accumulation of sediment such as sand or mud. Wind and other weathering conditions wash away sediment on land, depositing it in bodies of water. For this reason, fossils of sea creatures are more common than those of land creatures. Land animals and plants that have been preserved are found mostly in sediments in calm lakes, rivers, and estuaries. The likelihood that any living organism will become a fossil is quite low. The path from the organic, living world to the world of rock and mineral is long and indirect. In the best conditions, fossilization will occur if an animal or plant dies and is quickly covered over with moist sediment. This prevents the animal or plant from being eaten by other organisms or from undergoing natural decay through exposure to oxygen and bacteria. The soft parts of an animal or plant decay more quickly than its hard parts. Teeth and bones are therefore more likely to be preserved than skin, tissues, and organs. Because of this fact, most fossils come from the time period dating to almost 600 million years ago, when organisms began to develop skeletons and hard parts. Amber: Transparent golden-brown resin fossil formed from hardened pine tree sap. Cast: Fossil formed when a mold is later filled in by mud or mineral matter. Geologic time periods: Episodes in Earth's history marked by different climate factors, sea levels, and lifeforms. Index fossil: A distinctive fossil, common to a particular geological period, that is used to date rocks of that period. Mold: Fossil formed when acidic water dissolves a shell or bone around which sand or mud has already hardened. Petrifaction: Process of turning organic material into rock by the replacement of that material with minerals. 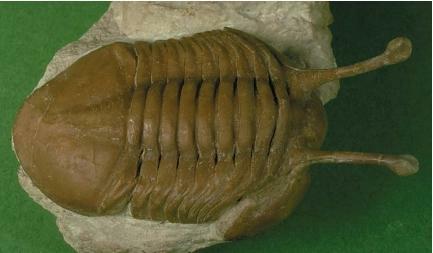 Successful fossilization or preservation of an organism can occur in several ways: (1) preservation without change; (2) complete replacement by a mineral; (3) filling in of a hollow space by a mineral; (4) formation of a thin film of carbon; and (5) formation of an imprint or the filling in of an imprint. Bones, shells, and teeth are examples of fossils preserved without change. The entire skeletal remains of animals that fell into ancient asphalt pits and quicksand have been preserved undamaged. Sometimes an entire organism may be preserved whole. An example of an almost perfectly preserved organism is an ancient insect trapped in pine tree sap. 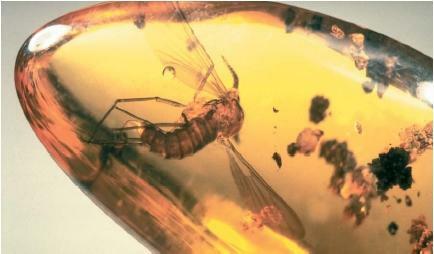 Over time, the pine sap hardened into a transparent golden-brown resin called amber, which contains the body of the insect. The remains of animals trapped in ice—such as woolly mammoths—have been found with skin and hair intact. The process by which an organism is completely replaced by minerals is called petrifaction. The best-known example of this process is petrified wood, as seen in the Petrified Forest National Park in Arizona. Trees in this area were buried in mud and sand that contained the mineral silica. Ground water carried this dissolved mineral into the trees, where it replaced the wood cells so completely the trees became hardened opal. Sometimes only small open spaces or holes in a shell or bone are filled in by dissolved minerals. The added mineral matter makes the shell or bone more compact and stonelike, preventing it from decaying. Another type of fossil is the darkened carbon imprint of a buried plant or, more rare, animal. When an organism dies and is buried, pressure underneath Earth's surface compresses the organism between rock faces. The organism decomposes, leaving a thin film of carbon on the rock face in the form of the organism. (All organic matter is made of carbon.) Leaves, insects, and fish are often found preserved this way. An imprint in rock or the filling in of that imprint are other very common fossils. When an organism trapped in hardening sedimentary rock was dissolved by acidic water percolating through the rock, only the shape or form of the organism remained as an imprint. The cavity remaining in the rock is called a mold. If the mold were later filled in by mud or mineral matter, the resulting fossil is called a cast. of organisms that lived for a short period of time in many areas. Since fossils and the rock they are found in are considered to be the same age, specific index fossils found in different rock layers in different areas indicate that the rock layers are the same age. This is a great website! thank you it is very resorceful and helped me with my fossil project alot and thanks again! Thanks for the information!It really helped me on my 2o page test! Thanks! This realy helped for my Earth Science homework! Cool article. Have any scientist found things like tropical plants in cold places? Great information and declarification on fossils! Very helpful! What is needed for an organism to be fossilized? I'm not so sure if you have already answered this, and if you have, could please make it a little clearer. 'Cause you state all of the different ways for an organism to be fossilized, but not what is needed for the evidence to be fossilized. But other than that, thank you for your information, let's hope that it will help me get an A on my test tomorrow! WOW, thank you so much, after reading this, i have managed to squeeze in some extra information for my science test in the next period. and just wondered how long it had been their. Thank you so much. Helped me with my Earth Science homework. Will recommend this to other students in my class. I THINK IT IS COOL.. and it helped me so much on my science homework and my teacher asked what I used and I said this really cool website. Thanks this might really help me on my test so much facts/kinda interesting read all. Really, Helped me a lot on my project. And i got a A+ On my test cause i used this site. !! !Wow really helped with my science work... Thanks for the help!!! Thanks, this helped me with my Science Olympiad homework. really helped thx so much i got an A+ on exam I did it thank you so much for this website it keeps making me type words until i have a minimum of 50 done.